The SS Minnedosa – British Home Child Ship – The Ships They Came On. Originally intended for the Hamburg-America Line, the emigrant ship SS Minnedosa was built on the banks of the River Clyde by Barclay, Curle & Co. The keel was laid in 1913. There was accommodation for 550-cabin and 1,200-3rd class passengers. Her engines were to be fitted by Harland and Wolff in Belfast. However, it wasnâ€™t until October 1917 that she was towed to Belfast for their installation. Purchased by Canadian Pacific during this time, she was also refitted as a troop carrier and officially entered service on December 5, 1918. Her maiden voyage from Liverpool to St. John, New Brunswick, carried Canadian troops returning home. After her trooping duties were completed, she travelled Canadian Pacificâ€™s regular route till June, 1922 except for a single, round-trip voyage from the UK to Bombay in December1919 for the British government. 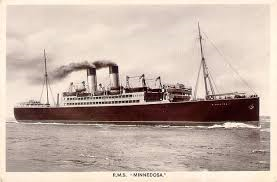 From 1920 to her laying off in 1931, about 2,000 British Home Children from various organizations including the Catholic Emmigration Association, Middlemore Homes, the Fegan Homes and Barnardoâ€™s came to Canada aboard the SS Minnedosa. After 1922, the ship moved over to the line’s Antwerp-Southampton-Canada route until her refitting in 1925 at Hawthorne, Leslie & Co. in Newcastle. She now had accommodation for 206 cabin, 545 tourist and 590 3rd class passengers. After the refitting, she returned to the Antwerp â€“ Canada route until 1927, but then went back to serving the Liverpool â€“ Canada route until 1931. The Minnedosa was sold for scrapping in Genoa in 1935, but was bought from the breakers by Mussoliniâ€™s Italian government, renamed the Piemonte and refitted to be used as a troop transport during Italy’s Abyssinian campaign. Badly damaged by a torpedo attack near Messina in November 1942, the Piemonte was withdrawn from service. An airborne Allied bombing attack in 1943 caused her to capsize and sink, and she lay, half submerged in shallow water. Raised in 1949, she was then towed to Spezia for scrapping.